Цілі: учити учнів розповідати про свої уподобання, інтереси; розкривати творчі здібності учнів; розвивати пам'ять, здогадку та самостійність у праці; підготувати учнів до написання розповіді про своє хобі; виховувати інтерес до корисних захоплень. Обладнання: підручник О.Д.Карп’юк “English 5”, картки з письмовим завданням (НО1-4), комп’ютери. T: Good morning pupils! Nice to see you again at our English lesson on the topic “Unusual hobbies”. Today we are going to speak, read, write and work on computers and play games. But first of all I want to ask you a question. Are you in a good mood? I think you are because it’s important. It helps us to learn new things/ let us learn a chant. We are in a good mood. T: I’m in a good mood too. Do you like to listening to music? Do you like playing with cards? Do you like collecting badges? Учні ланцюжком відповідають на запитання вчителя, висловлюючи свою думку з приводу створення мультфільмів. 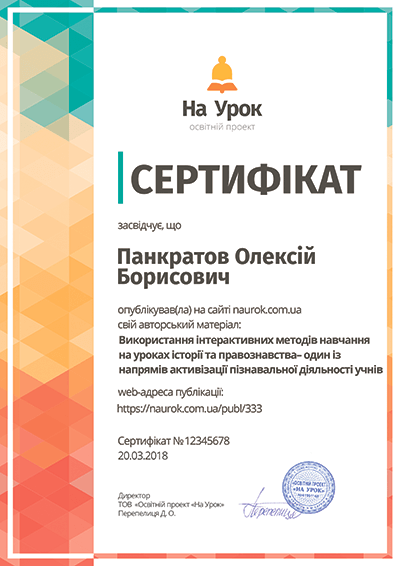 Робота в групах. Учні в групах по черзі читають і перекладають текст, звертаючись у разі необхідності до вчителя. what you (your friends, brothers or sisters) collect and what else you (they) would like to have. 1) What is the boy doing now? 2) What game does his father like to read about? 3) What present did the boy give to his sister? 4) Is mother interested in painting? 5) What is the family’s hobby? T: Now look at the pictures and questions. What is the first question? Answer it please. Now read the other questions. Can you answer them? Why not? Because you haven’t listened to the story. Be attentive now and in a short while you’ll be able to answer the questions. Учні прослуховують текст з голосу вчителя і виконують завдання на картках. I enjoy reading books. I’m lucky I’ve got a big library at home. I like to read about sports and sportsmen. I’m reading an interesting story about hockey now. My father likes to read about football. He’s got a lot of books about that game. My sister is fond of animals. She likes to read about them. She has got books with funny stories and fables about animals. I gave her a present yesterday, a very big interesting book about animals at the zoo. There are a lot of funny stories in it. My mother is interested in history. She spends a free time with a book on history. I can say that reading is my family’s hobby. Match the family members with the books they like to read. books about sports and sportsmen. 3) Post-Listening Activity. Етап перевірки розуміння змісту тексту. HO(3): 1) What is the boy doing now? T: Now children we have to do another task. We are going to do practice on computers. Select “Writing test”. T: While some pupils are working on computers we are going to do another task. We will begin to write short compositions about your favourite hobby. T: Now, let’s have fun. Complete the words for hobbies. T: Do you like our topic? Did you like our today’s lesson? What was the most interesting task for you? Why? Well done, children. You were great today. I’m pleased with you.